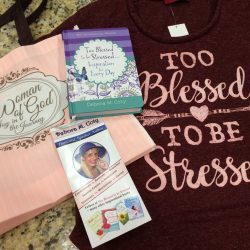 Not only am I here to announce the winner of my Tee & Tote Giveaway, I’m tickled pink to be sharing with you some of the terrific summer blessings submitted by the BFFs (Blessed Friends Forever) who entered. I was so blessed by your warm and fuzzy summer blessings, folks, and I wish I had space to print more of them. Happy moments in the sunshine! I can’t tell you how much I enjoy hearing about your special memories. I know you’ll all find these samples uplifting and delightful. “My friend (actually my sister in Christ) has a pool. Several of us ‘sisters’ get together occasionally and just have good clean fun in the pool. We laugh, pray, shoot water guns, praise God, sing hymns, and play around like young kids. We’re all in our late 60s and early 70s and probably give the neighbors an earful with our shouts of joy, praise, mirth, and child-play. What a wonderful blessing God has given us.” ~Bobbi B. “I love spending time with the grandkids painting rocks. Then we leave them at different places for others to find.” ~Vicky D.
“I’ve had so many blessings to de-stress my summer. 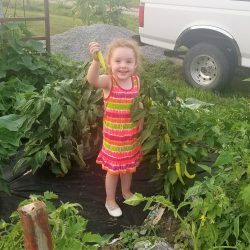 I’ve hunted fireflies (lightning bugs here in Kentucky), played in the rain, worked in my flowers, and planted a garden – all with my partner, my 3-year-old granddaughter Isabella. We are now reaping the rewards of our gardening and I’m including a photo. Thank you for reminding me just how very blessed I am!” ~Connie S.
“My best summer blessing is that my husband is recovering from his stroke of three months ago and we are able to enjoy time at the beach. Our routine is that my husband drops me off at East Beach on St. Simon’s Island and I have a lovely 90-minute walk, watching the waves, collecting shells, and passing a few words with many other who enjoy walking. While I’m walking, my husband drives to the village and has a little walk along the pier. He then drives to 5th Street and sets up our ‘beach camp.’ Chairs, table, umbrella, picnic, and maybe a game. We then both sit and enjoy the ocean or play a game. I read a few pages of my Kindle book, we have a swim, eat our picnic lunch, and spend more time watching the waves. Just bliss. I am so grateful that I am blessed with my husband and such a lovely environment for us both to enjoy.” ~Dee O.
Diane Buie. Congrats!!! 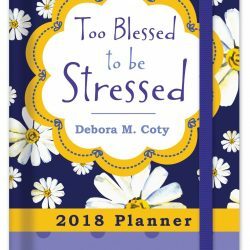 Diane will receive a fabulous gift package, including a Too Blessed to be Stressed tee and an autographed copy of Too Blessed to be Stressed: Inspiration for Every Day. 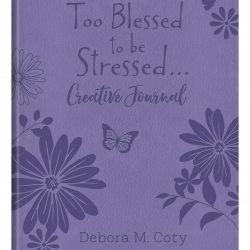 By the way, I’m super excited to announce that Sam’s Club has special-ordered a cute purple Creative Journal that will be bundled with Too Blessed to be Stressed: Inspiration for Every Day, and sold as a gift package, beginning in October. So while you’re shopping at Sam’s, be sure to pick up a handful (they’re a great deal!) for all the BFFs on your Christmas list. I’ll be sharing more details in my September e-newsletter ( you can subscribe right here at my website). Congratulations to Diane and I pray that she will be blessed each time she uses her tote. Thanks Debora for sharing some of the blessings from others. Even though we are living in very troubled times and negativity seems to be the emotion that rules the day it is plain to see that many of us do feel blessed and we choose to focus on those blessings. May God continue to bless you and your readers! So true, Connie. Negativity is running rampant throughout our society nowadays. I pray that more people will make the choice to see through the perspective of their blessings rather than their stressings. Isabella is adorable! Thanks for sharing the great summer stories and for spreading blessings of Joy!! Thanks, Sandi. I guess you’ll be making great summer stories in a different place next year! Can’t wait to see the progress.